Poore Sheher Ki Awaaz... Famous Studio Mein! 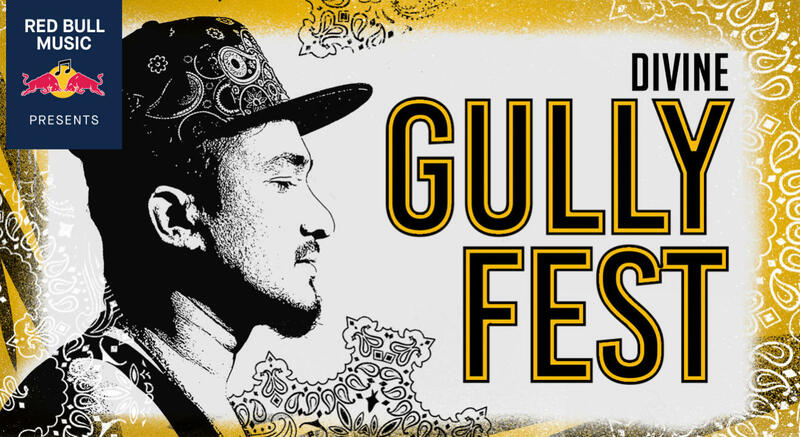 Mumbai's Jungli Sher, DIVINE, is bringing the sound of the Gully to the forefront with Gully Fest. A selection of some of the best upcoming voices of Mumbai Hip Hop coming together and celebrating the journey of Hip Hop from the streets of New York to the gullies of Mumbai. The grit and the romance of the streets comes to the stage in what promises to be a belter of a show. DIVINE started his career as an underground rapper in 2011, his track ʻYeh Mera Bombayʼ received the best video award for the year by Rolling Stone India. His track titled "Daru Daru" with Punjabi music producer and singer Deep Jandu and Canadian Rapper Gangis Khan was his first commercial song under Sony. His recent single "Farak" topped the Indi popcharts on iTunes India, and also featured on the radio show Beats1, playing out in over 100 countries.He has been part of Nucleyaʼs album Bass Rani, opened for acts like Skrillex, performed internationally for the BBC Asian Network Live showcase and sung for filmmaker Anurag Kashyapʼs Mukkabaaz. Having been the inspiration for Ranveer Singh's role in Zoya Akhtarʼs Gully Boy, a narratively powerful DIVINE, keeps it real as heard on ʻMere Gully Meinʼ. He is currently working on his debut album which is to be released in 2018. Delhi Sultanate aka Taru Dalmia & Begum X are India's foremost reggae and dub act. They are the founders Bass Roots Foundation sound-system, Own of only 2 authentic Jamaican reggae sound-system in South Asia. They are the lead singers of Delhi based ska band The Ska Vengers. Their tunes have topped reggae charts and they’ve opened for Julian Marley and Snoop Lion on their India tours. 'MAJOR C', your friendly-rotund DJ has been"around" spinning the hottesttunes on the coolest decksbefore kids beganexchanging music on cassettes. One of Mumbai's premier DJ's and the main man behind the acclaimed Hip-Hop act "Bombay Bassment", 'MAJOR C' has been conceived by the system way before anyone even knew the 'scene'. Fresh off the block with his foray on the world stage with his band; ‘Major C’ has recently returned from ‘Glastonbury’ having performed at the illustrious music festival along with the likes of Coldplay, Adele, LCD Sound system , Congo Natty, Protoje to name a few. But 'Major C' is no rookie with the big guns, having opened and shared stage with 'Snoop Dogg', yes the original gangsta daddy of 'hip-hop', in the year 2013 and also Shared stage with the legendary reggae band ”The Wailers” in the year 2015.